Many people are drawn to older homes because the style and craftsmanship can’t easily be replicated today. Renovation is often an adventure for both the homeowners and their contractor. If a house has been standing for over a hundred years, some of its history may be hidden by attempts to update the home by generations of owners. 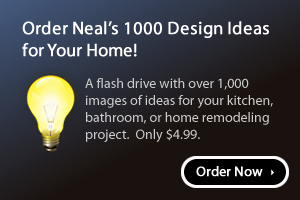 This was true when we worked with the owners of a 146-year-old home on a kitchen remodeling project. 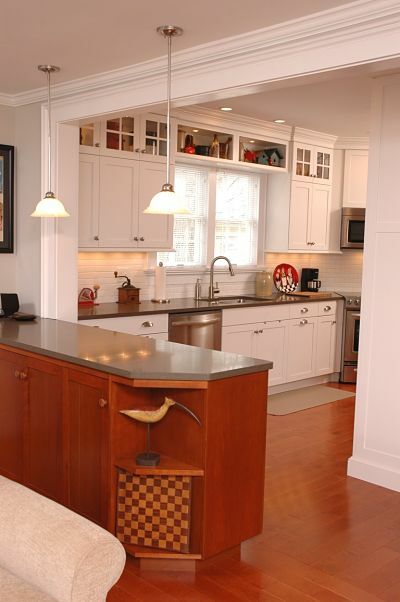 What started as a simple kitchen update turned into a renovation project that restored vintage architectural details while improving the function and living space. 1) Connect the old with the new. They wanted to preserve some of the historic features of the kitchen but needed a functional space to accommodate modern appliances. They also wanted display shelving for their collections. 2) Create more practical storage space. The one wall of storage cabinets was not adequate for the kitchen. 3) Resolve problems created by a peninsula that was too large for the kitchen. The homeowners really didn’t like the peninsula because it took up too much space. It was, however, in relatively good shape with cherry Shaker-style base cabinets. 1) Preserving the brick elements found during demolition. These included a brick wall, fireplace chimney and support column that would impact the placement of cabinets. 2) Resolving the problem of the oversized peninsula. In addition to being too large, there was a soffit above the peninsula that created an uneven ceiling. 3) Integrating the kitchen with the adjacent family room. The kitchen opened into a family room with dark 1960s wall paneling, old shelving and a wood-burning fireplace. The two rooms were separated by the large peninsula and visually connected. One of the requisites was to provide adequate shelving for the homeowners’ antique collections and additional storage. 4) Updating and connecting the flooring of the first floor of the home. The dark vinyl kitchen floor and beige carpet in the adjoining family room and dining room were not true to the period of the home and did not unify the three rooms visually. The floor plan designed for the galley-style kitchen took into account the brick features and also modified the work area, storage space and peninsula. 1) Cabinet placement. 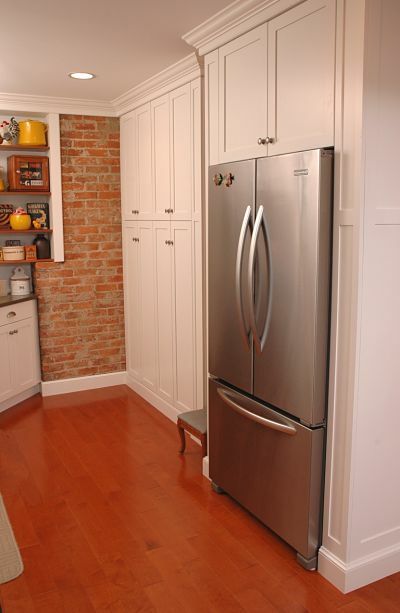 A wall of cabinetry was designed to fit around the uncovered brick structures and around a new refrigerator. 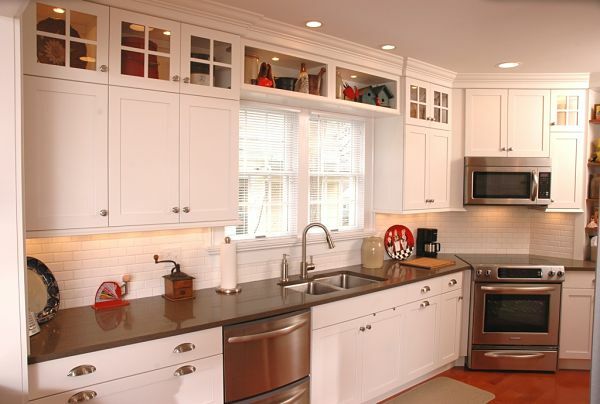 To optimize the space above the sink, open shelves with accent lights were installed, providing display space. 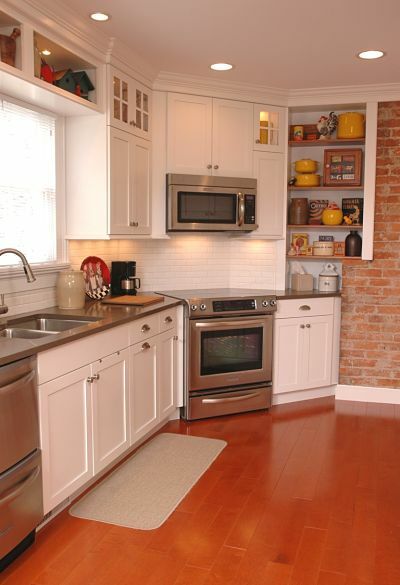 Base cabinets were customized and reworked to gracefully end the countertop at the space next to the brick chimney. An open wall shelf also integrates the brick into the design. A closet in the dining room was sacrificed to add more storage space to the kitchen. 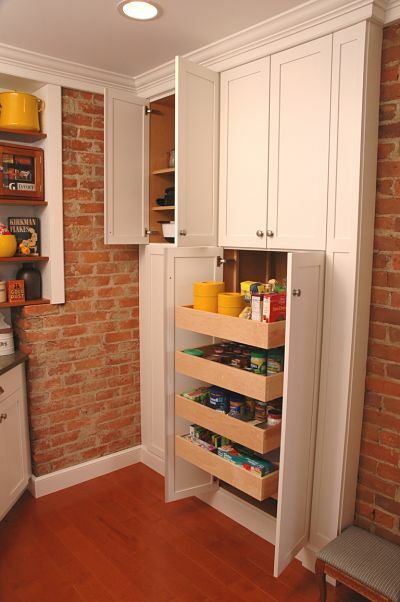 The new tall cabinets include convenient pantry pullout shelf inserts for easy access and to keep contents organized. 2) Redesigned peninsula. The cherry base cabinets of the original peninsula that separated the kitchen and family room were salvaged and reused. 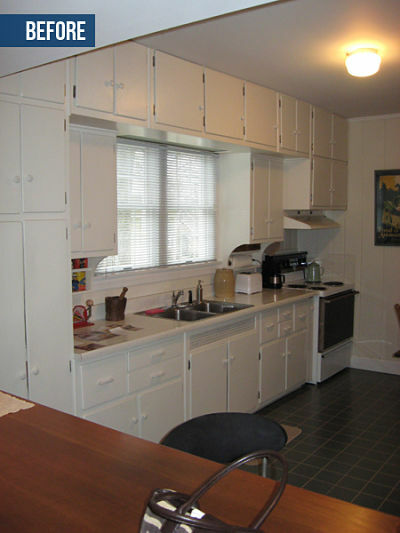 The cabinets were reduced in size to fit the new floor plan. Storage space on the kitchen side was eliminated to provide barstool seating for two. The countertop was replaced with granite that was also used for kitchen counters. The soffit was removed and replaced with a trimmed arch, an architectural element that aesthetically defines the kitchen and the family room. 3) Update the family room and integrate it with the kitchen design. The original fireplace and hearth were given a facelift and resurfaced with granite. The existing mantel and screen were re-used. The big change, however, was to re-work the entire wall with cabinetry that matches the new kitchen, providing more storage while maintaining some open display space. The new cabinets also provided space for a flat screen television. 4) Replace flooring. Wide plank pre-finished wood flooring was selected by the homeowners to unify the kitchen, dining room and family room. 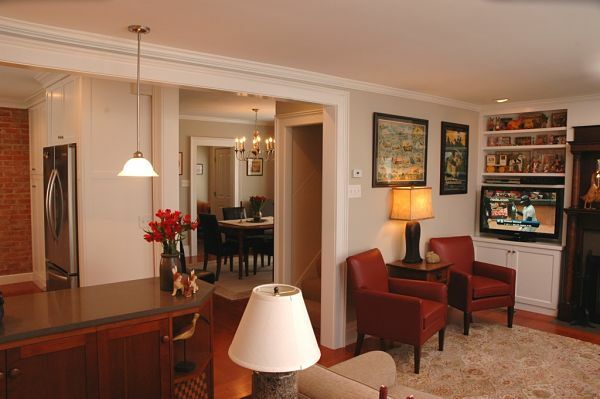 The style and color they chose reflects the type of flooring that may have been original to the home but also complements the refurbished brick of the walls and cherry cabinets of the peninsula. The layout of floor boards was carefully considered and designed to define each of the three rooms. Look closely at the photo below and you can see a transition in the direction of the floor boards and thresholds in each room. 5) Connect the old with the new. Modern conveniences were added to the kitchen including a new stainless steel range with microwave oven/vent hood, a built-in French door refrigerator and a matching dual drawer dishwasher. 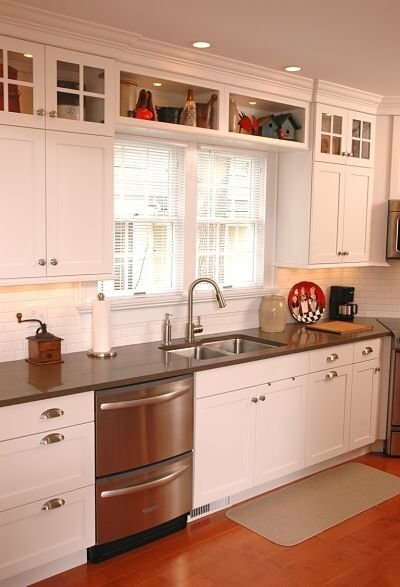 A transitional style faucet with a pullout spray complements an undermount stainless steel sink. A classic white subway tile backsplash and wide plank wood flooring tie all of these elements together. Wood trim, the fireplace mantel and the fireplace screen were salvaged and matched to new products, tying the existing architectural elements and new elements together, even in the renovated spaces. 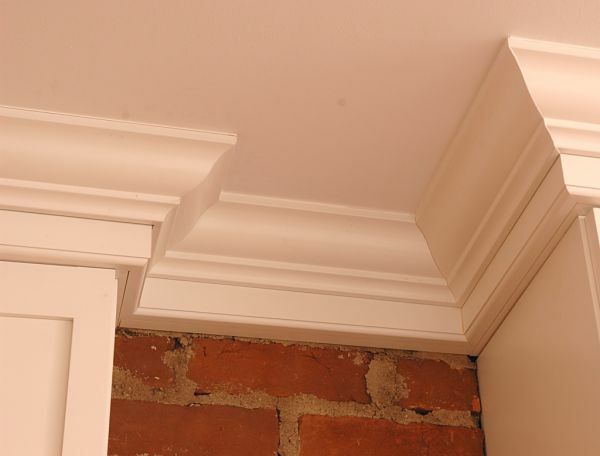 Crown molding was used to unify the rooms.